It’s not often that the subject matter from this blog crosses streams with another passion of mine. As a Georgia Bulldog alum and rabid college football fan, I look to the first two games of 2013 that feature a matchup between my alma mater and South Carolina’s two top football schools– Clemson and South Carolina. So what does this post have to do with the Revolutionary War (other than Georgia’s band is called ‘The Redcoats’) you ask? The state flag of South Carolina is steeped in Revolutionary War symbolism. The crescent moon was established by Colonel William Moultrie. 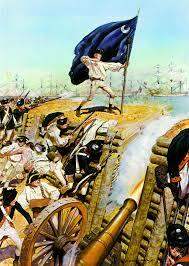 Moultrie’s historic defense of Charleston during the British Naval attack on June 28th 1776 successfully repelled an attacking British force that was unaccustomed to losing battles. After the battle, Moultrie’s crescent moon standard became an inspirational symbol of liberty during the war. Over sixty years later, the palm tree was added as a reference to the hastily laid palm trees that were added to the walls of Fort Sullivan’s Island that day. The soft wood of the trees actually helped absorb (and some claimed to even ricochet) British cannon balls. But like Georgia, the Redcoats would be back. Charleston fell during the British Southern campaign almost four years later in 1779. 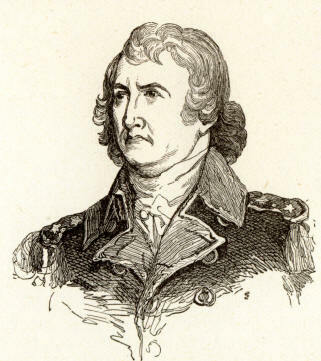 No trees would save the residents of Charleston from Henry Clinton and the might of the British Empire. This week I hope that Georgia Coach Mark Richt will direct his inner Henry Clinton and that quarterback Aaron Murray will summon the leadership of Cornwallis to lead the dawgs to victory this weekend. May running back Todd Gurely run roughshod over the Gamecocks like Banastre Tarleton on a retreating militia unit. May Steve Spurrier suffer from bouts of narcolepsy like Benjamin Lincoln as he gameplans for the Dawgs. May the Georgia Redcoat band play victorious tunes at the end of the day. An in the words of the immortal Larry Munson, hunker down you harry dawgs. 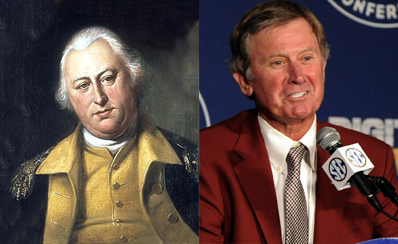 Spurrier and Lincoln…I think I see a resemblance.